For many women, it can often be a stressful task shopping for the perfect wedding ring for your soon-to- be husband, especially if he isn’t someone who regularly wears jewellery. This means that a lot of thought and consideration needs to go into what style and design you should be choosing that you believe he would wear the most. However, understanding that wedding bands are usually a lot simpler than engagement rings is something that you can be reassured with. The key factor to consider is what type of metal you would like for the wedding rings. In the past, it was quite simple. Wedding ring metal were often just a choice between White Gold Wedding Rings or Yellow Gold Wedding Rings. These days there are so many metal choices - including Rose Gold, Platinum, Chrome, Tungsten, and much more. While it is hard to gage ‘weight’ in a wedding ring from simply holding it - assume that this wedding ring will be worn for prolonged periods of time to do everyday tasks, meaning that the weight of the ring will be noticed quite quickly. Different metals have different densities, such as Platinum, which is significantly more heavy. Metal weights are definitely a thing to consider - especially if your partner works with their hands a lot. The comfort factor is also determined by the design of the band. How does it feel on the hand? Some wedding bands have sharper edges, and others are more rounded out. When you’re finding a ring for your man, don’t just simply try it on and stand there. Clap your hands together, put them in your pockets, shake somebody’s hand, and so forth. This will give you a better idea of how it feels wearing the ring and doing everyday activities. Does your partner work with his hands a lot? This might mean that he’ll need a ring with metal that can withstand an environment of wear and tear. If he works in a labour-intensive industry, it might also lead you to choose a more forgiving style - such as a comfort fit wedding ring that is easier to clean without any textured or patterned surfaces. It’s important to get the right style of ring for your partner, as it’s likely that he will be wearing this for the rest of his life! Have a quick look through his wardrobe before you go in for your wedding ring consultation. Does he have a refined, casual look with polos and chinos? A medium 6mm width, yellow gold band is a timeless, classic choice. Does he frequent graphic shirts, jeans and sneakers? An understated 4mm white gold metal band might suit him more. If he fancies more bold, masculine fashion - a wide black Tungsten band might be more preferable. When in doubt, you can always take some photos of his closet or even photos of himself that will help your consultant to point you in the right direction. 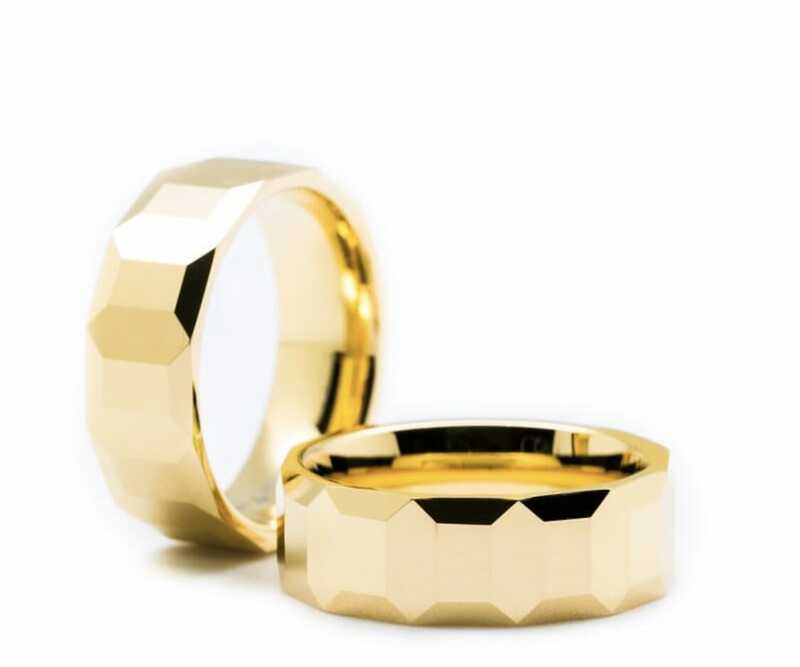 Pattern types may be a little easier to choose from, given that you’ll know whether your man would want an understated, minimalist ring - or one that has more intricate details. These should be answered in the first 3 steps of the process. The harder thing to choose is metal type - as many people do not know about the benefits of the various metals, apart from the colour. So what wedding ring metal types exist? Comes in various shades - white gold, yellow gold, rose gold & green gold. Gold does not tarnish or react with the atmosphere, and it is a soft metal that allows it to be easily be moulded into intricate shapes. Apart from its malleability, one other very desirable property of gold is that it mixes well with a lot of alloys that lends to both its colour and firmness. In addition, the value of gold increases through the years, meaning that a ring bought today will be even more valuable over time. Silver wedding rings are preferable due to its economical nature - but stringent standards regulate the branding of this metal. Silver jewelry is usually made of 92.5 percent silver with 7.5 percent copper, a standard mixture referred to as sterling silver. It is then marked with the number 925. In the United States, an alloy has to be made of at least 90 percent silver before it can be marketed as silver. Another mixture of silver is Britannia silver, which contains 95.8 percent silver and 4.2 percent germanium. This mixture is more resistant to burning. Platinum rings feel substantially heavier than gold or silver, and this metal doesn’t need to be plated with rhodium due to the metal already being very white and lustrous. It is often used for very high- end pieces, as platinum is more expensive than gold. Unlike gold jewelry where you use an alloy that is only anywhere from 75 percent to 37.5 percent gold, platinum jewellery is almost pure platinum, and it’s extremely rare, making it a material that is extremely popular among the rich and famous. Titanium, with its grayish-silver color, is the hardest natural metal in the world. It is 300 percent stronger than stainless steel, twice as strong as aluminum, and a lot stronger than silver, gold, or platinum. However, in spite of its strength, titanium is an extremely light metal. It is also hypoallergenic, and does not react with the environment. This means that it can be worn safely while swimming in a heavily chlorinated pool, or in the sea. It can also be anodised to produce different colours. 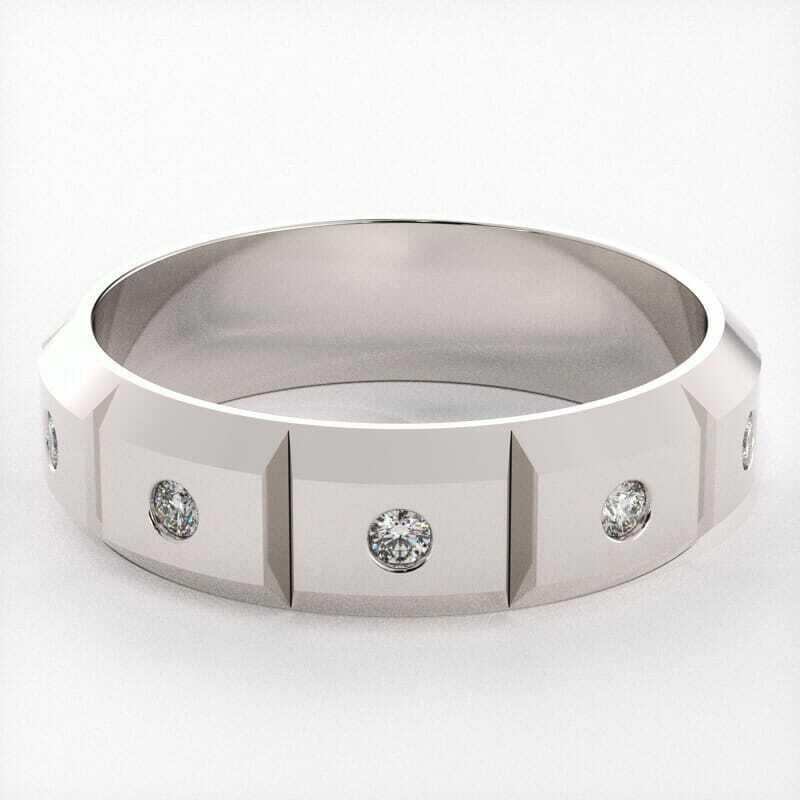 Tungsten Carbide is a material that is extremely durable and one of the strongest metals in the world that can only be scratched by a diamond, one of the hardest elements known to man. This material doesn’t show flaws, and is one of the most wear-resistant rings you can buy. However, due to the way it is produced, these rings cannot be resized, and can only be exchanged or replaced for a bigger or smaller size. Is one of the lighter metals used to make wedding rings - and is almost half the weight of platinum, making it an extremely affordable and lightweight alternative to Platinum or gold rings. Cobalt chrome is a highly durable hypoallergenic & biocompatible cobalt alloy used in a variety of industries for its strength, shatter proof and scratch resistant properties. At the same time, they are extremely malleable, making it possible to created a variety of unique designs. For more information on metal types, click here. While it may seem like there are a lot of factors to consider to choose your partner the perfect wedding ring, the benefits are that he usually won’t be too picky about the type of ring that you’ve chosen, as long as it’s comfortable and fits well! And at the end of the day, a ring is just a token of your love - and isn’t the only thing that will define your relationship!